HORROR. HE'S AFTER YOU TOO! Ha! 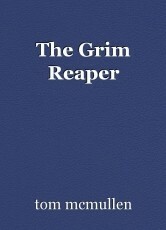 A good description of Mr Grim! Thanks Hullabaloo, yes I'm in rush to invite him home!